Ben Zimmer, executive editor of Vocabulary.com, Wall Street Journal columnist, chair of the American Dialect Society New Words Committee, and general renaissance man of all things wordy, delivered a wide-ranging, always humorous, and occasionally musical keynote address at the ACES 2015 banquet. 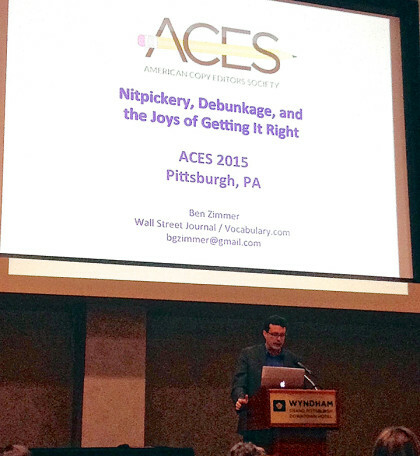 Ben Zimmer delivers the keynote address at ACES 19th national conference. We took a moment before Zimmer’s speech to talk words, technology and what it means when language changes. Q: When considering #blacklivesmatter for the word of the year for 2014, despite the concerns over a hashtag taking the spot, has the word of the year ever had such political implications before? How did you deal with the that? Zimmer: And as long as I’ve been involved in the American Dialect Society, I don’t think people have shied away from political terms, if those political terms are relevant and have something to say about the way people are talking. The one choice that was made which was somewhat political was “Occupy” in the year that the Occupy movement took off. In both cases I can say that certainly there was the political component but it wasn’t chosen to make a political statement or to express solidarity with the political point of view, but to recognize the way that language could be mobilized for social and political action. That was certainly true in the case of the Occupy movement. Interesting things can happen to language when it’s used in that way, in a political way. So with occupy it’s taking an old word and giving it a lot of fresh, new uses. Where the word occupy itself ends up being used — it’s kind of a template occupy. Occupy plus name of your town. But then also as a noun or as an attributive noun — the Occupy movement. So more recently with hashtags, certainly hashtags have been this new linguistic expression, which again linguists and lexicographers need to be paying attention to, that can be used for identifying with the cause or with trying to move people toward social action. Given the discussion in 2014 about Ferguson, about the Eric Garner case, a lot of the members felt it was important to recognize that this particular form of expression was being used as an expression of political solidarity or expressing that sentiment in a relatively new way — we’ve always had political slogans — but something different is happening, it seems, when they become hashtags. They can spread very quickly — you have a full phrase, or a clause which ends up working more like a lexical unit, even though we select a word of the year we’ve never limited ourselves strictly to single words. They can be phrases, they can even be prefixes. One year, the “e” prefix for electronic was chosen. Generally, though, the idea is that it has to be something that you would consider to be a vocabulary item or a lexical item, something you can imagine entering a dictionary, and those can be phrases. With #blacklivesmatter, it feels like it’s a whole sentence in those three words. In the process of being hashtagged, it becomes a pithier, more concise form and seemed to be spread very quickly that way. And then you get references where it’s treated like a unit, like the #blacklivesmatter movement. It was an interesting choice to have a hashtag not just be the overall winner, but to even consider hashtags in the first place. It’s the first year that we’ve done that. Q: What was that conversation like surrounding the idea of actually having a hashtag as the word? Zimmer: The process started with a nominating session. 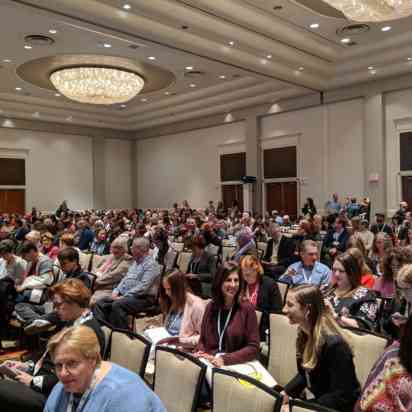 So the first part in this process at the American Dialect Society conference is a nominating session, which I chaired, where we’re selecting nominees for the different categories that we have: most likely to succeed, most useful, most outrageous, most euphemistic. So we fill out a ballot, basically, so that the following day, when we have the big event, people already have choices and nominees. We keep things flexible — you can always nominate things from the floor — but what we also do in the nominating session is if the discussion leads in a direction where we feel we need to create a new category, we’ll create a new category. So in election years, there could be a special political category. This time there was serious discussion in the nominating committee for two possible new categories: one was a hashtag category, and there was also some discussion about having one for emoticons and emoji. That did not succeed, but the hashtag one did. Perhaps in the future we’ll be thinking about things like emoji as well, but I think it was an interesting step. There was enough support for a hashtag category. There were certainly a whole range of hashtags to choose from and some of them had to do with race like #blacklivesmatter or #icantbreathe after the Eric Garner incident. Some of them had to do with gender. There was the #notallmen and #yesallwomen thing. Very often we find this to be the case that when people are talking about this, there’s this recency effect where things that have come up over the past few months seem important and you forget about the stuff that happened at the beginning of the year. A hashtag that had been more prominent at the beginning of 2014 was #bringbackourgirls from the Boko Haram kidnapping in Nigeria. And that didn’t get discussed and put on the ballot, but I think it’s just because these other ones had been more recent. Clearly, something is going on, something involving hashtags. Hashtag itself, of course, was a word of the year a few years ago. Where it’s fitting a linguistic message of a particular kind and making it easy to circulate, easy to share, obviously, on social media. You see it carrying over beyond social media so that if you went to any of the demonstrations after Ferguson or Eric Garner, people would have #blacklivesmatter on their posters. So the hashtags end up representing something new or a way of sloganizing or expressing something in a pithy way that also expresses a solidarity. Q: When you get down to that final selection process, what sways you one way or the other toward what’s actually going to be the word of the year? Zimmer: It’s very unpredictable. We come up with these nominees for different categories, but the way that we’ve done it is that we don’t actually select nominees for the overall word of the year category until we’ve gone through and voted on all the other categories. So the first evening we had the nominating session, then the following evening we go through a big room of people, the chaotic scene, but people being very vocal in their support or lack of support for different nominees for the different categories. And once we get through all of that, very often then through that discussion we recognize which are the ones that make sense — so when nominations come from the floor, very often they’re winners of other categories. So obviously #blacklivesmatter won its own new category, and then there were other words that had come up in the course of discussion — like “bae” — that people ended up nominating for the floor. There were some very eloquent arguments in favor of #blacklivesmatter, Sonja Lanehart, who had been the one to originally suggest this in the nominating session, ended up speaking very powerfully about it. Something like that can just sway the crowd. It ended up being not even close in the vote — you can check the website for the actual vote counts — but I wouldn’t have predicted that. But then again, when everybody gets in that room and starts talking about it, then in this case a consensus emerged around that. It was an interesting process to watch. Again, even though I was moderating the whole thing, I was trying to put forth my particular choice, so the dynamics are always interesting when you get people together to talk about that. Q: What are the most disturbing and the most uplifting trends in the English language that you’ve found? Zimmer: Something that can be simultaneously disturbing and uplifting I think is this general technologization of language. So new technology allows for new electronic forms of communication, which have their own emerging conventions. The fact that we’re spending all this time talking about hashtags when hashtags didn’t even exist just a few years ago. That’s something that starts off as something specific to Twitter just as a way of organizing conversation and then becomes so successful that it serves many different purposes. A hashtag doesn’t have to organize conversation, it can end up very often being a kind of commentary on what you’re saying. It can be ironic, it can be self-effacing, it can be very meta. All in the space of a short message, under 140 characters on Twitter and other short form messaging like that. People are looking for new ways of being concise with language. Hashtags are a good way of doing that. It also explains, in part, why emoji have been so successful in the last few years because you can just use a single character to identify your emotion, your stance, your attitude to what you’re saying or what you’re responding to. Those are fascinating developments, even if I am personally not a huge user of emoji or lots of crazy hashtags. I guess I would call it uplifting, sure, why not, to see the creativity and the innovation that people can have with a tiny linguistic canvas. The idea that short form messaging like Twitter or texting somehow dumbs down language — I don’t see that at all. It really ends up requiring you to shape the message to fit the medium and very often it’s done in a playful way. You start playing with linguistic conventions. That kind of linguistic play we’re seeing as people come upon a new resource — like oh, I have emoji on my phone, but how am I going to use that? There’s something almost childlike in the discovery that people have. Then you can see how people use it, what kind of conventions emerge out of that. There’s no one telling you how to use it. It’s not like there are rigid standards, so you can come up with it on your own, but what that also may lead to is sometimes misinterpretations as well, because even with something like emoji, what might seem like a straightforward message encapsulated in a particular image can be interpreted in multiple ways. But that’s true of any system of communication. Q: What do you think is the most important thing for copy editors to understand about the way words change? Zimmer: I think an understanding that language is fluid. 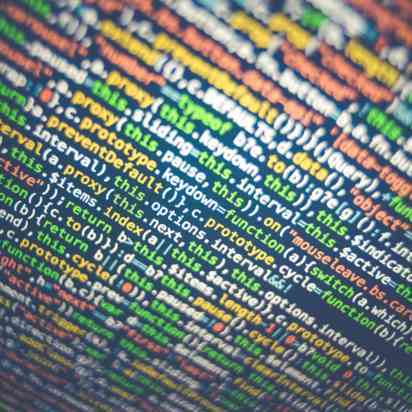 We try to fix it in various ways through style guides and dictionaries and various things that give the appearance that language is a static object, but it never is. Copy editors very often are just looking for consistent guideposts of various kinds and of course consistency is great when you want to maintain a particular style for a particular publication, whether it’s print or online. But as long as you’re recognizing that that is a particular style, which can’t be valued any more highly than some other style or linguistic variation. So I think that copy editors, though, when they interact with lexicographers, may grow to understand exactly how language can be flexible and ever-changing, and there’s nothing wrong with that, even if it’s unsettling, even if it’s daunting. Again, if you’re expecting there to be rigid conventions that can always be enforced, finding inconsistencies can be off-putting or anxiety-inducing. But language itself is not necessarily a logical system, a consistent system. You have to deal with words on a case-by-case basis very often because it’s dictated by usage. And you can identify certain patterns, like with compounds, generally speaking, the more people use them the more the compounds close, the more hyphens get removed in general — so email loses its hyphen over time, but other “e” words might not. 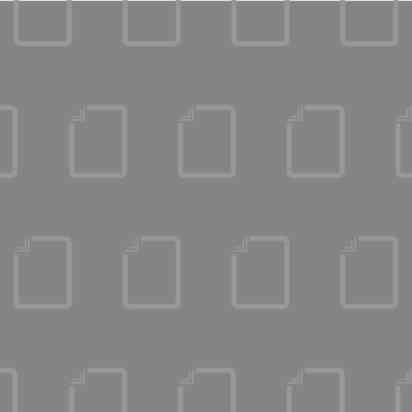 But those are patterns, they’re not rules, so if you’re always looking for a rule that’s going to tell you this is right or this is wrong, you’re always going to be disappointed with language because it has much more to do with tendencies, patterns of usage, no matter how much you try to standardize it.